Hello dear readers, it’s MAILBAG MONDAY again! On this special day I will search through my mountain of reader mail and answer the five most pressing questions! What’s that you say? Do I really get that much mail? Well, I’ll admit…the contact section of this website doesn’t get used that often, but, one of the perks of wordpress stats is that I can see the google search terms that people use to find my site. And I’m going to go ahead and pretend that these search terms will count as reader mail, since they are often entered in the form of a question. So as you read these, remember that each “question” was something that someone actually typed into google that brought up my site as a hit which they then clicked on thus letting wordpress stats report to me the search they used to find my site. I could make up the questions myself, but it turns out the actual google searches are far better than anything I could come up with! Top 10 worst fart smells? I can heal like wolverine. 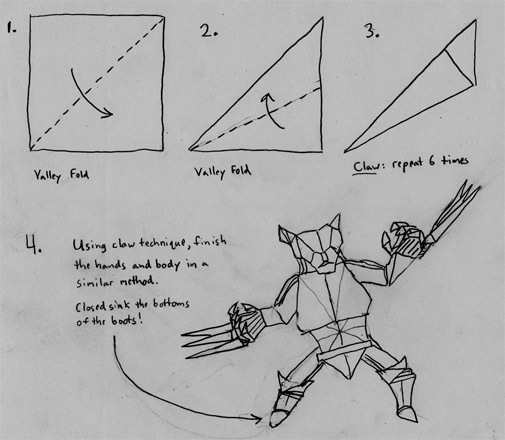 Easy origami instructions to make wolverine? So, without further ado, it is time to dig into the old Mailbag to see what kind of things have been on my reader’s minds in the last month! No, you can’t. And I really think you should take some time to learn how a search engine works…even if you could heal like Wolverine, google doesn’t care. As many of you may know, I have been doing origami for a while. And while I am pretty new to designing my own models, I actually have created my own Wolverine model. So, because you asked, I went ahead and drew up the easy folding diagrams* to post in response to your letter…enjoy! *I’ve taken a few shortcuts in the diagrams, but anyone familiar with folding origami should be able to fold the full model no problem. 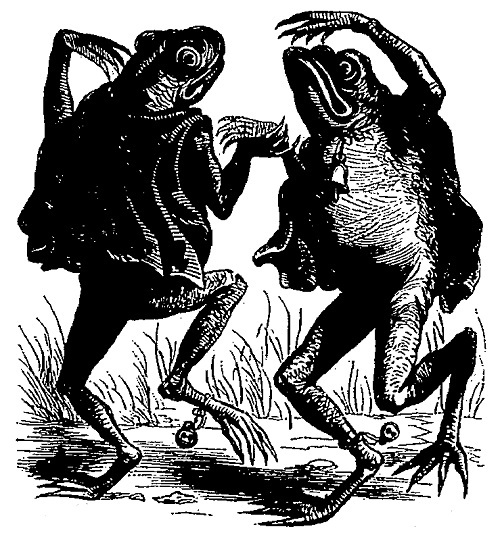 Once upon a (specifically medieval) time there was a princess who, despite the best efforts of her evil step-family (who met horrid deaths that were massively toned down to stern scoldings for this version of the fairy tale), lived happily ever after (once she found a manly prince to give her life real meaning). Also, the animals in this story can talk. I normally have no idea who writes the letters for Mailbag Mondays, but I think I know who wrote this one, and if this is who I think it is, I think I know what they are referring to. So, for the last time, I’m sorry for throwing up on your sheets. And then again on your mattress after you had removed the sheets and went to sleep on the couch. And I’m sorry for flipping the mattress over to try to hide where I threw up and managing to cover your box spring in throw up. And I’m sorry for then throwing up on the other side of the mattress too. Now will you let it go? Sheesh! That’s it for Mailbag Monday this month! Tune in the first Monday of next month when I discuss “A day the fart wars happened”! Thanks to your simple-to-follow instructions, I was able to complete my very own origami Wolverine! Thanks for sharing your model! Awesome! I was worried there would be confusion with the alternating valley folds in steps 1 and 2! And for anyone interested, there is a pretty good actual origami wolverine here, but I don’t know how to get diagrams. You forgot Chicken in a Biscuit farts…NOTHING beats those. Those just missed my list at #11. Fabio on Why I don’t like Dungeons & Dragons. Chris on How to make a homemade Frank Booth Halloween costume from Blue Velvet.